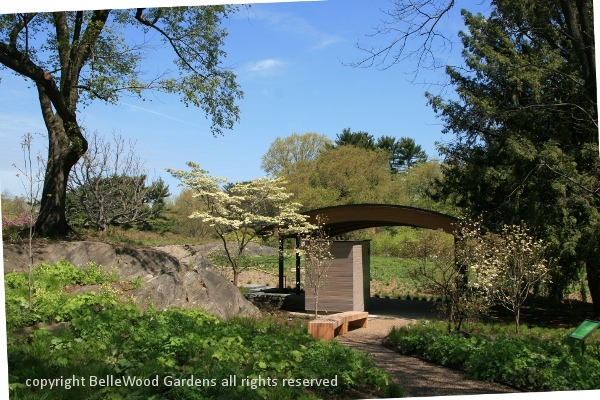 Five years in the planning and construction, this weekend of May 4th and 5th will see the first official opening to the public of the new Native Plant Garden at the New York Botanical Garden with a second grand opening on May 11th and 12th. And any accolade I can think of - superb, stunning, marvellous, elegant - are entirely appropriate. I was fortunate enough to get a preview tour today. 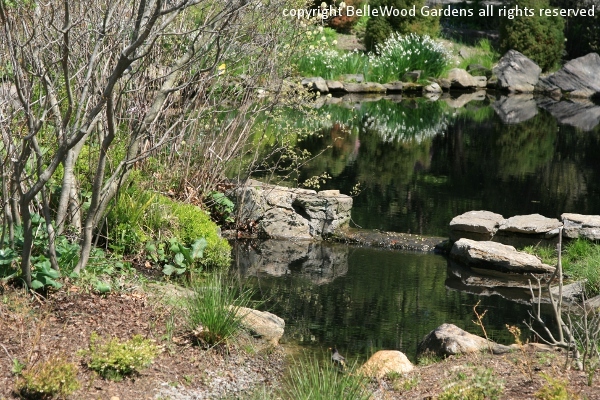 Spring, the time of new growth and new beginnings is a wonderful time to reveal the garden. 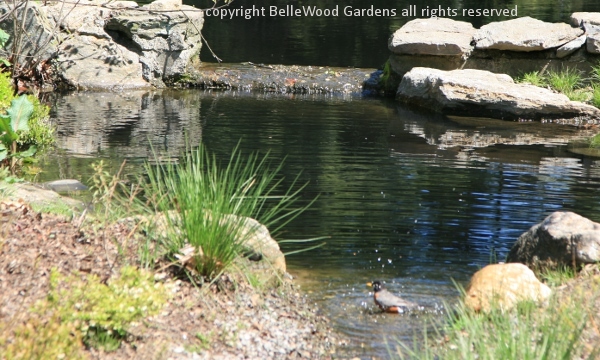 This is, however, a garden with woodland, meadow,and water features that will enchant visitors at every season of the year. Generously sized at 3.5 acres, the Native Plant Garden was designed by Sheila Brady, Principal at the firm of Oehme, van Sweden and Associates, the landscape architecture company noted for their New American Garden style incorporating native plants in attractive, lavish garden designs. 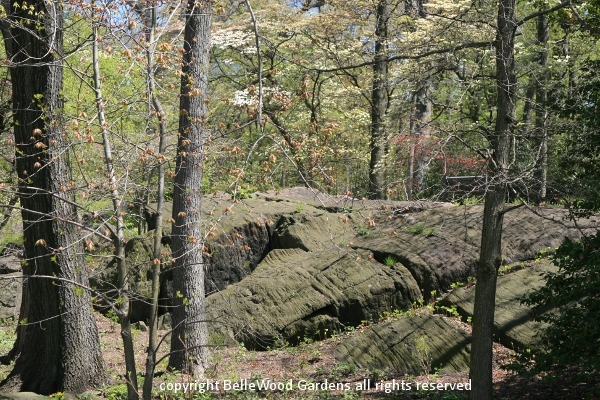 The site itself is a major player for the garden, offering as it does a terrain with a diversity of microclimates providing growing conditions that range from sunny wet meadow to deep dry shade, "borrowed scenery" of the ancient Thain Family Forest's mature woodland, and massive rock outcrops scoured and furrowed by the glaciers that in the past covered the region. 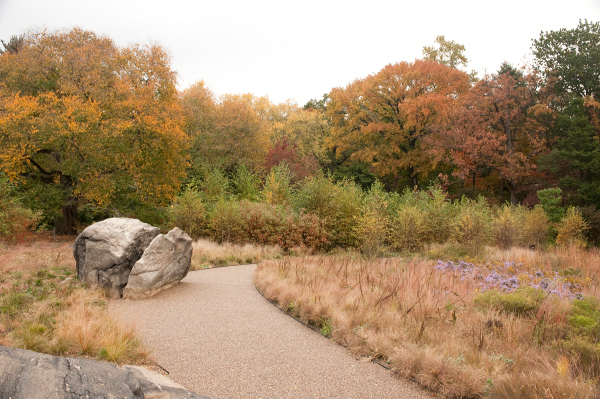 The previous native plant garden was habitat driven, placing plants as they would have grown in nature. 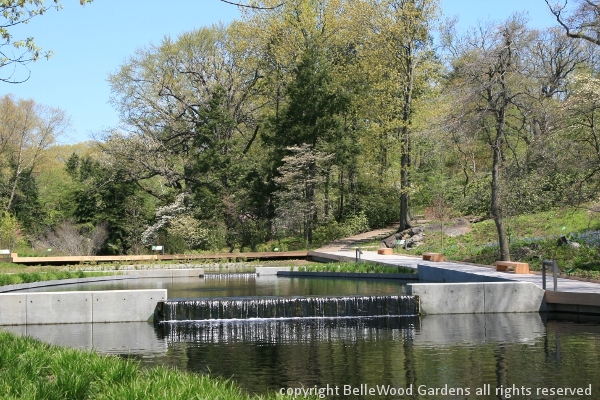 While this new incarnation is, of course, sensitive to the plants' needs, it incorporates them into a more "gardenesque" design, teaching / showing visitors that native plants are elegant ornamentals. what immediately grabs attention is the dramatic 230-foot long water feature. at its lower end appears, visually, to be part of the ecologically thoughtful water feature. robins and a goldfinch took turns splashing about. So true, the adage that "If you build it, they will come." 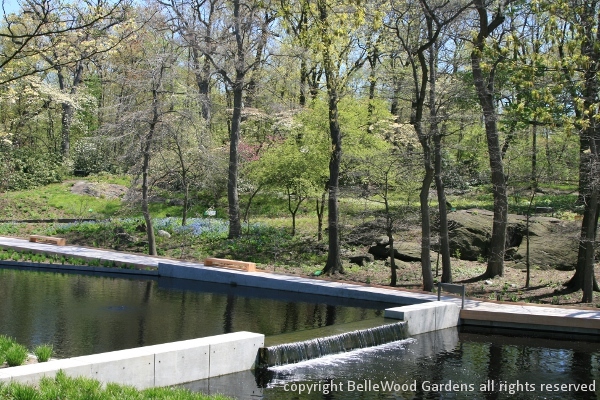 Poured concrete walls, basins lined with EPDM pond liners with sand and large, washed, Delaware River stones on top. Hamilton bluestone for the weirs. The single, one piece weir stone between upper basin and main basin is 22 feet long and weighs in at a hefty 14 tons. 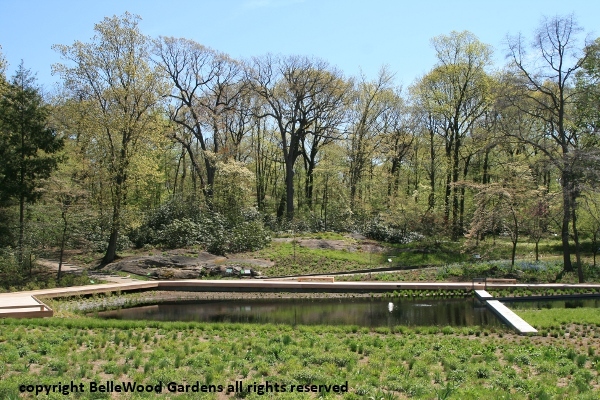 The entire water feature holds over 300,000 gallons, with three linked cisterns under the south end of the site. They hold 50,000 gallons of overflow / rainwater / make-up water. A biofiltration system beneath the wetland cleans the water that is recirculated from the bottom of the main basin. The recirculating pumping system pushed the water through a pair of perforated pipes called Centipedes, gravel, and wetland plant roots before it is returned to the upper and main basins, filtering it through several feet of stone, starting at 6 inches, reduced to 1 inch at the gravel surface. That's the technical stuff that makes this beautiful water system stay that way. As an indication that it is also ecological, dragonflies and tadpoles are already making themselves at home. 53 feet across at its widest point, there is a promenade along one side made from black locust. and forget, at least for the moment, that there is a city outside the botanical garden's boundaries. both important as a cleansing element for the water feature. Beyond, the land rises up to the woodland portion. There is a small narrow footpath through rhododendrons at the edge of the Thain Family Forest. water permeable surface) allows easy access for all, from babies in strollers to wheelchair visitors. when gardens take on a magical appeal in the softened light, with raindrops dimpling the water. will be welcome for the robins when they need to carbo-load before the migration to avoid winter. new leaves. Most are on one side of the path, a few on the other, for a charming sense of walking through nature. Woodland is where the flowers are in Spring. The meadow will take pride of place in summer. 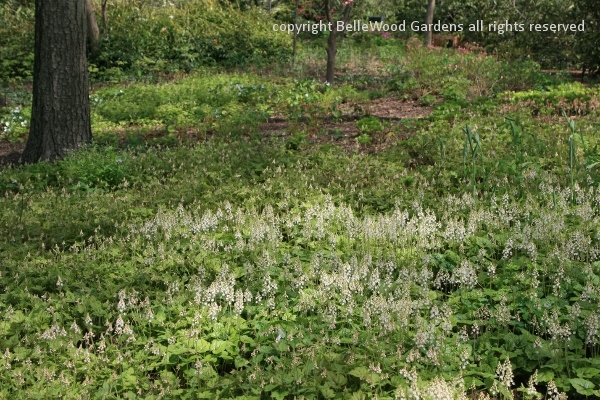 a pleasing native alternative to pachysandra, running myrtle, or ivy. 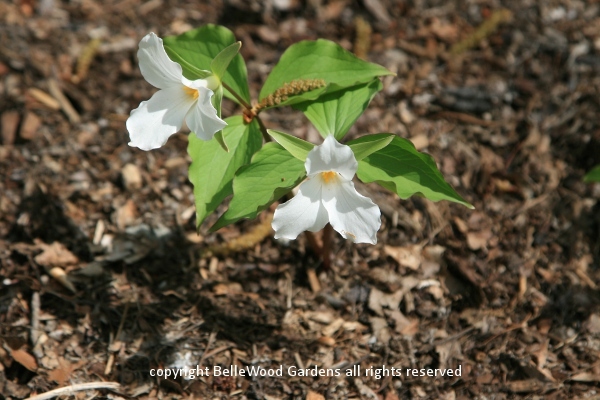 peduncle, or little stem between leaf and flower) Trillium flexipes, called nodding trillium. 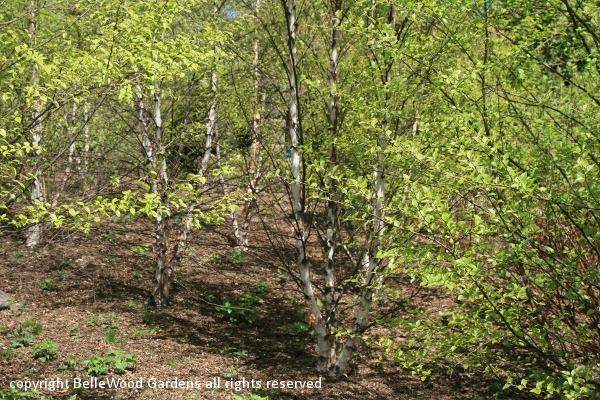 is a welcome addition for any shady garden as it keeps its attractive ferny leaves all summer long. 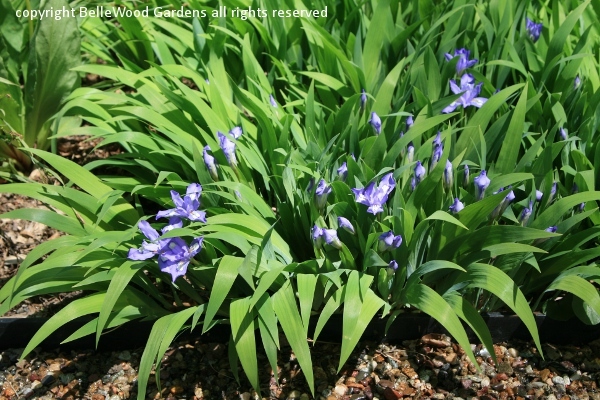 The little crested iris, Iris cristata, is useful for that awkward interface between sun and shade. cultivated variety. And natives can also give us selected plants with some special attributes. 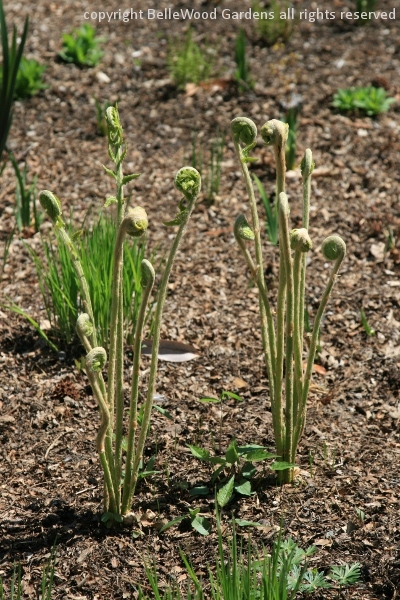 The season is unfolding, just like these osmunda ferns uncoiling their chaff covered fronds. and scored the surface. The ice is long since gone, gone for geological ages. Once wild woods grew here. They too are gone. But now the native plants are back with the new Native Plant Garden. This is not a garden to visit once, race-walk through, speed on to something else. Come. Take your time. Come again. Come at a different season. Imbibe the sense of the season. and tan and straw, with a haze of purple asters embellishing the meadow. Time flows. Keep in mind that the Azalea Garden is barely a hop and a skip, just a slow stroll away, for a wonderfully convenient pairing of plants and landscapes. 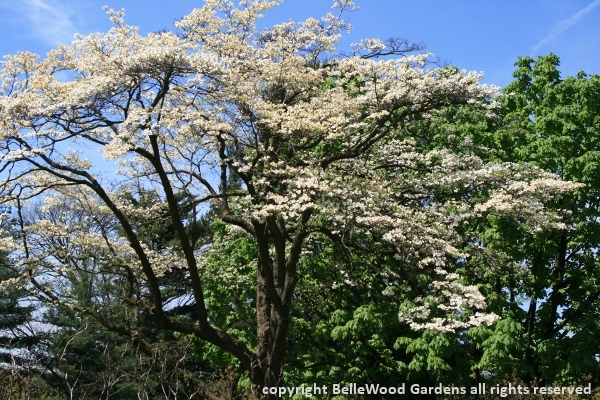 In May 2008 the New York Botanical Garden announced major gift of $15 million dollars from the Leon Levy Foundation. 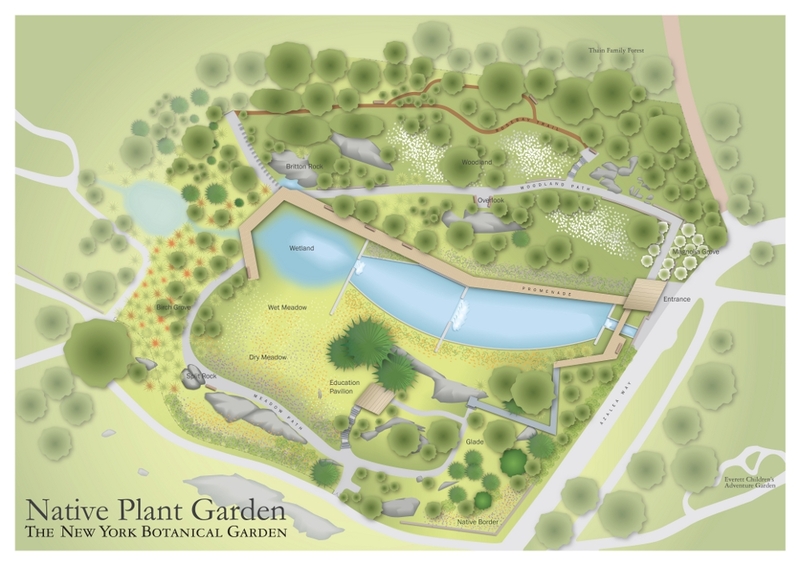 The goal - creation of a new Native Plant Garden, accompanied by educational materials and programs, and a major permanent endowment to secure its future. 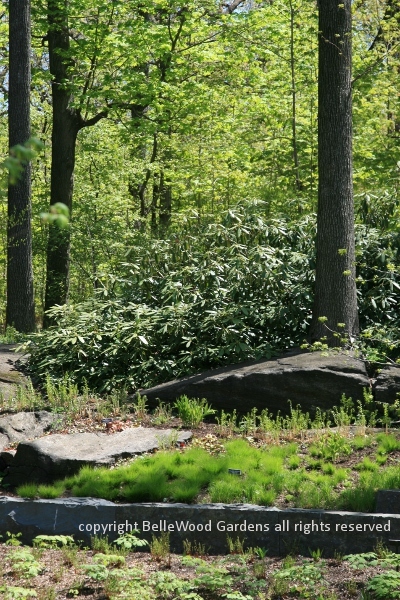 Adjacent to the native forest and rock garden, the 3.5 acre site is to serve as a center for the study and display of plants native to the northeastern United States, display a variety of native plants beautifully combined in an integrated and holistic design, one that will accommodate groups of visitors while preserving a sense of intimacy for individuals. They built it. Now you must come. See here for information about the special events, an interactive map, open hours, admission fees, special events, and more. Please note: On Saturday, 18 May 2013 I'll be teaching Course number 134BOT322 Native Bulbs for Your Garden,10:30 a.m. - 3:00 p.m.
Not all bulbs come from Holland. There are many native species that developed underground storage systems to withstand local climatic conditions. 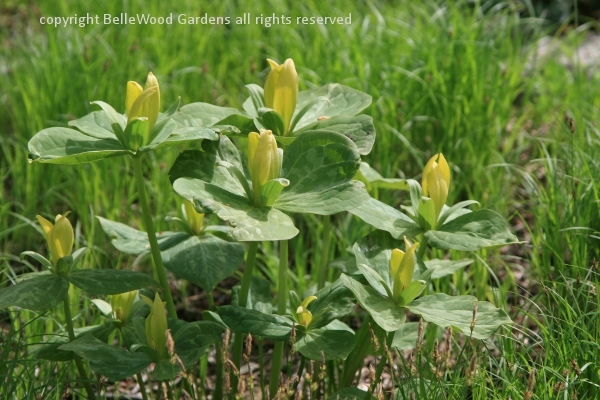 Explore the diversity of natives such as lilies, trillium, erythronium, and bloodroot that make exquisite additions to your garden. Learn the habitats and characteristics of these beauties, and enjoy an informative walk through the Native Plant Garden. Please bring lunch and dress for the weather. There's life beyond water lilies when it comes to plants that like wet feet, and many of them are native to this area. 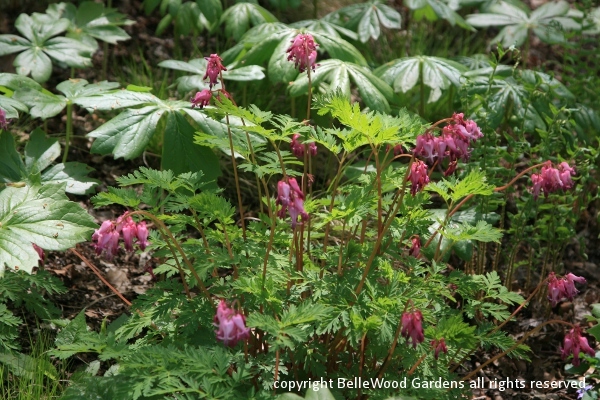 Learn to identify beautiful native perennials and shrubs that grow in damp to positively soggy sites. With evocative names such as never wet, cardinal flower, pitcher plant, and summer sweet, you are sure to find options and possibilities for that troublesome wet place on your property.